Some concerns that had been raised about the Red Shirts' planned blood protest are described at Jot ASEAN. At this time in Thailand, the protest leaders are collecting blood in preparation for throwing it on Government House. Bangkok Pundit lived-blogged these past events. (text, photos). Photo right by Nirmal Ghosh. Ghosh was there, live-blogging these past events in Bangkok. Pongpan Chumjai, Prachatai, Red shirts launch “Blood Sacrifice” campaign (text, photos, video). Photo right by Prachatai. 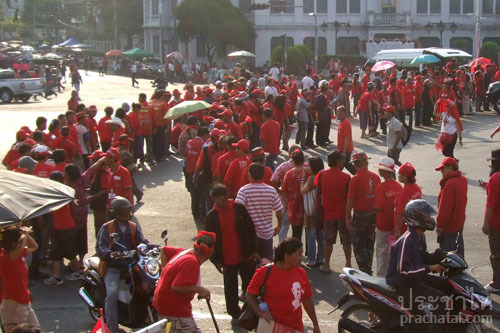 This morning, thousands of red shirts lined up to have their blood drawn by medical activists, a day after red-shirt leader Nattawut Saikua vowed to collect "1 million cubic centimetres" of blood to spill at Government House on Tuesday evening. More blood will be shed at the headquarters of the Democrat Party on Wednesday and the Prime Minister's house on Thursday if the protesters’ demands were not met. John LeFevre was there live-blogging these events. Newley was there live-blogging these past events in Thailand.